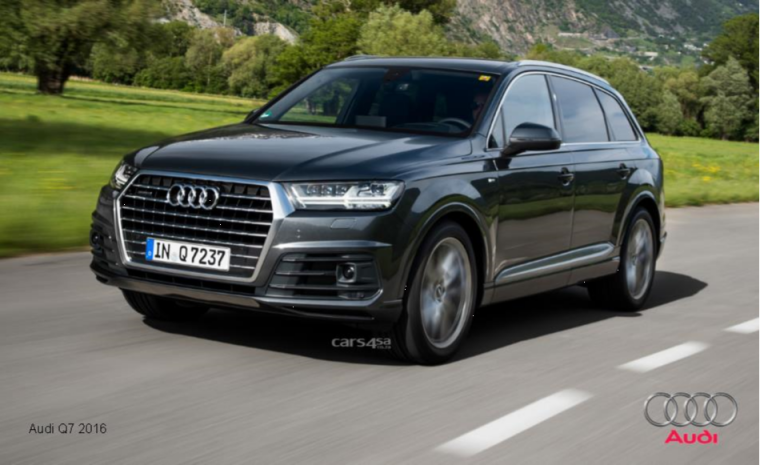 Audi`s all-new 2016 Q7 reveal a handsome albeit somewhat familiar look for the new Q7, but while the exterior may not have changed much engineers have totally revamped things underneath the sheet metal. How much lighter is it? A substantial 325kgs lighter in 3.0-litre TDI trim, for instance. The 2016 Q7 TDI measures in at 2000 kg, making it one of the lightest options among seven-seat SUVs in the premium segment. At the same time, it is one of the most spacious in its segment despite its exterior dimensions shrinking. Further efficiency improvements come from the powertrain department with the entry-level option being a 2.0-litre TFSI joined by two V-6s, a 3.0-litreTDI plus a 3.0-litre All 2016 Q7s will come with an eight-speed S tronic automatic transmission. Further down the track Audi will add a second 3.0-litre TDI option. While the Q7 has taken a big step forward, things are about to get very crowded at the top of the SUV segment, with the upcoming entries from Bentley, Rolls-Royce, and even Mercedes-Maybach. To stay in that highly profitable game—and to retain the owners of the previous V-8 and V-12 TDI versions—Audi will launch a V-8 TDI, a V-8 turbo petrol engine, and possibly even a W-12 turbo gasoline engine.